Antique Western Silver is unique to North America and the United States as well as the world. Silver Jewelry has been very popular for hundreds of years in North America and was introduced to the Native American Indians of Southwestern United States in about 1865. An Navajo Indian Silversmith named Atsidi Sani learned how to make Silver Jewelry from the Spaniards as they had come to the Southwest in search of Gold and Silver. This is a great place to start our discussion on Antique Western Silver. The Navajo, Zuni, Hopi and Anglo Americans have made Western Silver Jewelry in the Southwest since Atsidi Sani taught others the trade beginning in the late 1860's. The Western Silver business has been brisk here in the Southwest and Antique Western Silver Jewelry from the early years is very collectible. There are many different styles that have been made throughout the years as Southwestern Western Silver has evolved dramatically. Below are some great examples of Antique Western Silver Jewelry from the Southwest along with descriptions so you can get an idea of the Antique Western Silver pieces that were once made in the American Southwest. Today, Antique Western Silver has become highly collectible by individuals worldwide and Southwestern Antique Western Silver Jewelry is one of the most valuable types of Antique Western Silver items in demand. Durango Silver Company has dealt in Antique Western Silver for nearly 40 years and we have a category on this website called "Vintage Jewelry" where you can view what we currently have online for sale. We also have a large collection here in Durango Colorado that is available if you are in the area. To the left is a beautiful Antique Navajo Indian Western Silver Ring from about 1915. This is a classic and typical style of Silverwork done by the Navajo Silversmiths from that era. 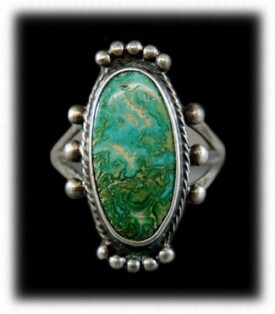 This Antique Western Silver and Turquoise Ring was made by melting Silver coins into ingots and then pounding them into sheet and wire. The Silver wire used on this ring was hand drawn and then twisted to make a rope design. The Silver balls are called raindrops by the Navajo, they were made by melting the silver with a torch, when you make silver molten it clusters into a ball. The green Turquoise stone appears to have come from Nevada. You can read more about this antique western silver ring and see a larger photo by clicking on the link above. 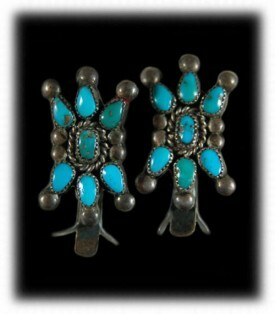 To the right is an Antique pair of Western Silver and Turquoise Earrings that were Navajo Indian handcrafted about 1930. 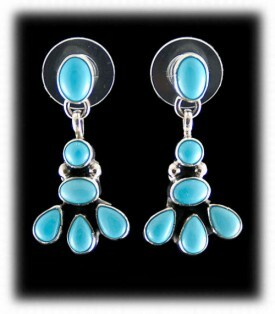 This pair of Earrings were made in the Squash Blossom design that the Navajo Indians are famous for. 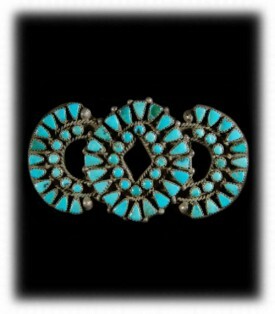 This is a classic pair of Antique Turquoise Earrings and Antique Western Silver. The Turquoise Stones appear to have come from the Kingman Turquoise Mine which is one of the oldest Turquoise Mines in the U.S.A.
To the left is is an outstanding and very rare Antique Navajo Ingot Bracelet that was made in the early 1900’s and probably around 1910 and is a great example of Antique Western Silver. It is very heavy with exceptional silverwork. It has an old Turquoise stone, probably from Nevada and was made from coin silver. The metal has silvered out inside which is what seasoned Indian Jewelry collectors look for and has been in a prominent Indian Traders collection for over 75 years. Many Antique Western Silver collectors call this type of Antique Western Silver Jewelry "Ingot" as it was made by melting the Silver and pouring it into a Silver bar or ingot and then worked from there into Jewelry. The Silver in Antique Western Silver Jewelry was made from Silver coins that the Indians got from the U.S. Calvary and then the Indian Trading Posts. To the right is an old Navajo Turquoise Cluster Bracelet, it was made about 1930 and is considered Antique Western Silver Jewelry today. The Navajo began making Western Silver with multiple Turquoise stones early on and the Zuni Indian refined multi stone Turquoise Jewelry with what is known as Zuni Needlepoint and Zuni Petit Point Jewelry. Native American made Antique Western Silver pieces are becoming very hard to find and are a good investment in Silver Jewelry. 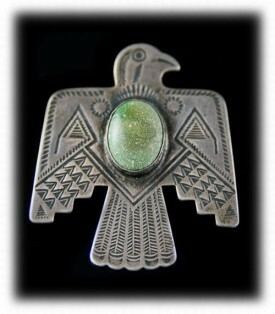 To the left is an Antique Western Silver Thunderbird Pin that was Navajo Indian handmade approximately 1915. The Turquoise Stone has strong indications that it is from the Cerrillos Turquoise Mine which was the first Turquoise Mine found by the Anasazi Indians over 2000 years ago. 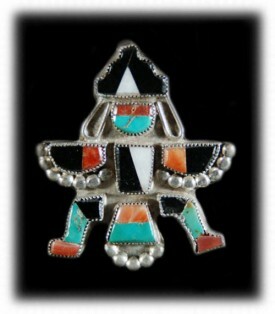 This is an awesome old Native American made pin that is now considered Antique Western Silver. To the right is a wonderful heavy vintage Navajo Necklace made with hand stamped bench made beads and a heavy tufa cast Naja with the same stampings that are on the beads. This piece was most likely made prior to 1920 as it is very heavy and made with coin Silver. American Indian Art collectors search long and hard to find Antique Western Silver pieces of this quality. To the left is an Antique Western Silver piece of Native American Indian Jewelry made by a Zuni Indian in the 1940’s. 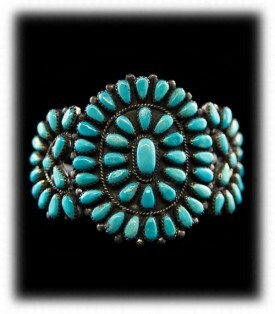 This is considered Vintage Indian Jewelry and is an exceptional example of Zuni lapidary work. This pin was hand constructed in Sterling Silver and then inlaid with Turquoise, Coral, Jet and Mother of Pearl. 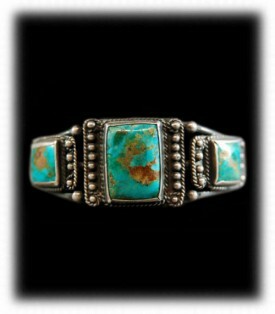 The Zuni Indians are famous for their stone inlay work, Needlepoint and Petit Point stone work set in Sterling Silver. What a great example Antique Western Silver. To the right is a beautiful Western Silver Turquoise Pin that came out of the Fort Defiance Trading Post collection. It was made prior to 1955 and probably around 1945. The Turquoise stones are natural and appear to be from the Morenci mine as I find several to have iron pyrite in them. It once was sewn on a Navajo women's blouse as there are old loops that were part of the piece when it was originally made. Another great example Antique Western Silver. 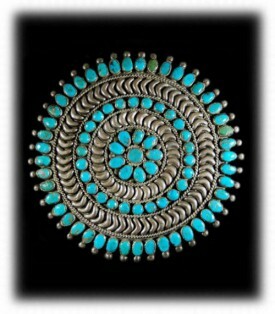 To the left is a very nice Antique Western Silver Zuni Indian handmade Turquoise and Silver Pin. This old piece of Western Silver Jewelry is quite unique as well as attractive which makes it desirable as a piece of Antique Western Silver Jewelry from our American heritage. To the upper right is a Zuni Squash Blossom Necklace was made between 1935 – 1950. It is an exceptional piece that is of uncommon quality that is very rare and not often seen for sale. This necklace is of the highest craftsmanship and includes a fantastic Naja that is unique only to this particular necklace. The stones appear to be old Arizona Blue Turquoise from the Mineral Park Mine which is now considered the Kingman Turquoise Mine. All of the stones were individually cut to perfection and the overall design of this piece is superb! 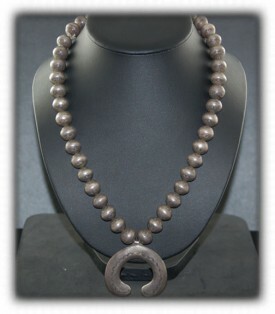 The Necklace was made in Sterling Silver and is strung on 5mm handcrafted Silver Beads. To the left is a nice pair of Western Silver Earrings that are not antique, but, made in the antique style of Indian made earrings front the 1930 era. There are many Silversmiths as well as Western Silver Jewelry manufacturers in the Southwest that make old style Silver and Turquoise Jewelry and this is a good example of modern look-a-like old Indian Jewelry. 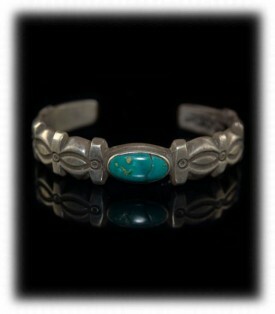 To the right is an Antique Western Silver Navajo Indian Turquoise Bracelet made approximately 1920. This is a classic old Navajo Indian Silver Bracelet style that was made long ago and is just as beautiful today for a collector of quality Antique Western Silver Jewelry. The Navajo Indians hold a major part in the heritage of North America and the Silver Jewelry that they made is some of the most important Antique Western Silver from our American history. For more information - Check out our presentation on Western Silver. We hope you have gained some useful knowledge from our Antique Western Silver educational presentation page. We invite you to learn more about Silver Jewelry, Indian Jewelry and Turquoise Jewelry by following the links in our Learning Center which has many other informational pages that we have written on topics related to Southwestern Silver Jewelry. In addition, we would like to invite you to join our E-Mail Newsletter - about once every other month we send out a Newsletter to inform our members of what's happening with Durango Silver Company, new products, specials for our members and more. 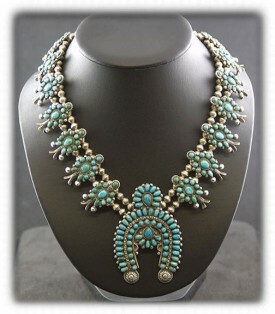 We also have a monthly drawing from our members toGiveaway free Turquoise Jewelry from our company. Please take a moment to become one of our friends and future winners in our giveaway by signing in below. Thank you for viewing our presentation on Antique Western Silver.